Cell death: Is our health at risk? The life and death of the cells in our bodies are tightly regulated. This is essential for normal function and limiting damage. But cell death can have side effects, and if it malfunctions, our health is at stake. Every day, more than 50 billion cells die in our bodies. These are not random events, but part of a finely tuned biological mechanism called programmed cell death. Multicellular organisms, including humans, need to keep a tight lid on the number of cells in their bodies. This would be easy if the cells never divided, but some areas - such as the blood, skin, and lining of the gut - are constantly producing new cells. Cell death stops excessive and damaged cells from accumulating. This balance, or homeostasis, is essential to maintain a healthy organism and to prevent disease. It is also a crucial mechanism of defense against pathogens, as cells that are infected with bacteria or viruses are removed this way. Under normal circumstances, dying cells are recycled by the immune system. But unfortunately, programmed cell death is not a foolproof mechanism. When things go wrong, it can have dire consequences. Cancer, autoimmune conditions, and neurodegeneration are all linked to failures of normal cell death and cell clearance. There are several different ways that a cell can die. Whatever is at the root of cell death, the corpse lodged in the tissue cannot stick around forever. Here, we enter the realm of the phagocytes, which are specialized white blood, or epithelial, cells that are able to swallow, or engulf, dying cells. Phagocytes patrol our tissues on the lookout for "find-me" signals released by dying cells, and then engulf them when they encounter "eat-me" signals. They are also the gatekeepers of inflammation, and cell death can either be pro- or anti-inflammatory, leading to different outcomes. Apoptosis is the most common form of cell death and is referred to as programmed cell suicide. During apoptosis, a cell is broken up and packaged into small, self-contained pieces, which are easily recycled by phagocytes. Apoptosis is often kick-started by an accumulation of stress signals, such as damaged DNA or low oxygen. This causes leaks in the membranes of mitochondria, which are the powerhouses that convert oxygen into energy in the cell. Once mitochondria are damaged, a cell is well and truly on its way to becoming a corpse. Apoptosis can also be initiated by outside triggers. These activate so-called death receptors on the cell. To make it easy for patrolling phagocytes to home in and engulf apoptotic cells, they release strong "find-me" and "eat-me" signals. The main hallmark of necrotic cell death is swelling leading to rupture of the cell membrane. This leads to components leaking out from inside the cell, in much the same way that air leaks from a tyre with a puncture. Necrosis happens in response to high temperature or high pressure. Scientists call this the passive form of necrosis, as it does not require any specific activity by the cell. However, there are two forms of necrosis - necroptosis and pyroptosis - which are actively regulated by the cell and are now recognized as specialized forms of programmed cell death. As with passive necrosis, swelling causes the cell to burst. But inside, closely orchestrated sequences of events take place. There is some evidence that necroptosis may be a backup system that kicks in when certain pathogens, which can inhibit apoptosis, infect a cell. Both necroptosis and pyroptosis are thought to actively initiate inflammation to alert the immune system of pathogen infection. Because these processes cause the cell to burst, components from within the cell spill into the surrounding space. These act as danger signals, or damage-associated molecular patterns (DAMPs). Phagocytes and other immune cells react strongly to DAMPs by springing into action and causing inflammation. "This technique is an evolutionarily invaluable contribution to innate immunity, combining the killing of pathogen-infected cells with alerting the immune system through the release of DAMPs," noted the authors of a recent review about programmed cell death. This is specific to necroptosis and pyroptosis and does not usually occur during apoptosis, in which cell components are neatly packaged. However, if phagocytes fail to clear apoptotic cells quickly, these cells can turn necrotic, resulting in inflammation. Under normal circumstances, autophagy is a pro-survival mechanism. In response to nutrient starvation, a cell can gain essential nourishment by digesting part of its interior. But it also serves a way of countering cell stress, which can occur when proteins aggregate or damage to the cellular machinery occurs. Autophagy allows a cell to remove the danger by digesting the culprits. 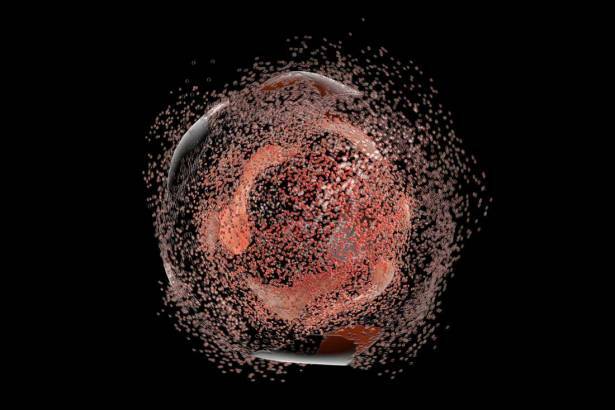 Scientists now believe that autophagy itself can trigger cell death, although it may be a rare and highly specialized event. Autophagy is certainly known to play a role when tissues are formed during development, and it is also thought to contribute to both apoptosis and necroptosis. The tight regulation of cell death is necessary to maintain the balance of functional cells in our tissues and to prevent infection. If this is impaired, it can have severe consequences, as a recent article about cell death signaling pointed out. Cancer cells are masters at evading our immune system and avoiding death. When a cancer spreads to distant sites, or metastasizes, the culprit cells must overcome cell death pathways to avoid facing their demise in the process. Many cancers have developed sophisticated mechanisms to do this by hijacking components of the apoptosis, necrosis, and autophagy signaling pathways. By deactivating these, cancers can avoid cell death when they spread through the body. Anoikis is a specialized form of apoptosis, which occurs in cells that have detached from their normal environment and find themselves in a new home in the body. This is crucial in preventing cancer cells from spreading. But cancers have evolved clever ways of preventing anoikis from cutting short their deadly excursions to find new homes in our bodies. Some cancer drugs target programmed cell death in order to reactivate these processes and kill the cancer cells. But cell death pathways do not happen in isolation, and activating one type of cell death does not guarantee that a cell does not switch to a different pathway, thus avoiding the therapeutic effect. The inflammatory response to the release of DAMPs that follows necroptosis and pyroptosis, and to some extent apoptosis, can have both immediate and long-term consequences. Inflammation induced by DAMPs can reach beyond phagocytes and lead to general, or systemic, inflammation. This, in turn, can lead to life-threatening sepsis. Scientists have also begun to understand the link between necroptosis and several inflammatory diseases, such as COPD and atherosclerosis. Pyroptosis has also recently been implicated in the development of systemic lupus. Cell death in neurodegenerative diseases - including Alzheimer's disease, Parkinson's disease, and Huntington's disease - is thought to occur via apoptosis of damaged cells. Necroptosis has also been linked to Huntington's disease, as well as amyotrophic lateral sclerosis, and scientists are increasingly looking at the link between inflammation and neurodegeneration. To tackle this complex interplay between disease and programmed cell death, a holistic view of the multitude of signaling pathways and processes involved will be necessary.